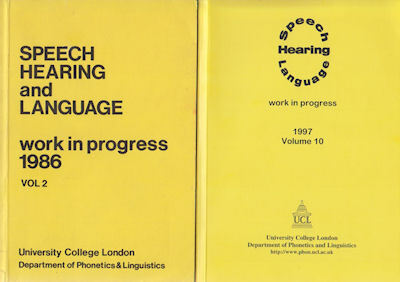 Welcome to the home page of "Speech, Hearing and Language: Work in Progress". These working papers described work from the Phonetics and Speech Sciences section of the Department of Phonetics and Linguistics. This publication was discontinued in 2002. Many previous volumes of Speech, Hearing and Language are available online. See the list to the right.